Subtle changes in body temperature can indicate a number of conditions and even give clues as to a person’s overall health. Digital thermometers have made it simple for anyone to measure their temperature at home, but they are often inaccurate. Complicating matters even further is the fact that most of us don’t think to take our own temperatures unless we have a fever. 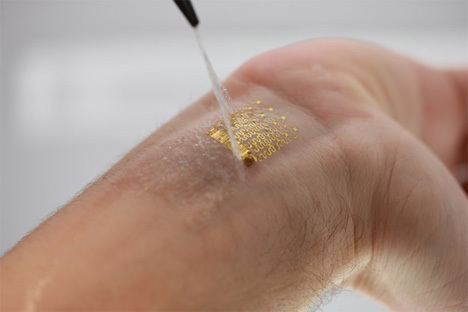 A flexible thermometer that adheres to the skin has been developed at the University of Illinois. The sensor, which is only as thick as half the width of a human hair, is incredibly sensitive and can measure temperatures with accuracy up to thousandths of a degree. 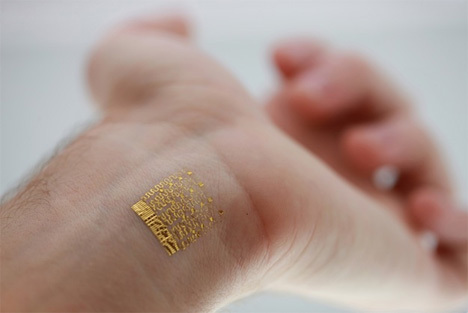 The sensor consists of tiny gold wires on a rubbery sheet. The sheet is perforated to ensure that the skin is able to breathe and move naturally. The ultra-thin sensor doesn’t just measure temperature. It can also measure skin hydration, blood flow, and even cognitive state, providing a more detailed picture of a patient’s overall health. Because it adheres to the skin – almost like a second skin – keeping constant track of a patient’s condition is simple, hands-off, and far more convenient than traditional types of health monitoring.